This is a unique and inimitable fruit, for which the Kiwigold Consortium holds the exclusive world patent. It is the product of a natural selection programme, carried out by international botanical institutes with the cooperation of Udine University. The yellow kiwi is sweet, has an extraordinary fibre and vitamin C content, is firm and juicy, with extremely fresh taste that children love too. It is attractive, with a bright colour reminiscent of the sun, and it keeps very well in the fridge at home. These are the reasons that have made it internationally famous and appreciated by consumers in numerous countries throughout the world. This is much more than a fruit: it is a symbol of wellbeing, energy and good dietary habits. The green kiwi is popular on tables at every latitude, because it tastes good and it does you good too. Rich in vitamin C and fibre, recommended by doctors and dieticians, it is always part of calorie-controlled diets. Particularly popular with women thanks to its benefits and delicious taste, it is also enjoyed by children, thanks to the sweet flavour which delights even the fussiest palates. 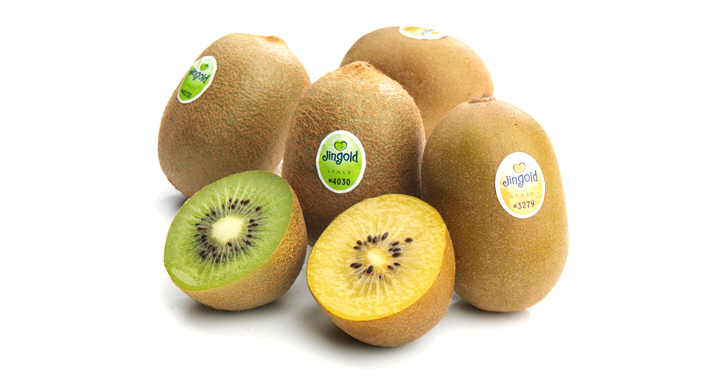 Jingold selects the best green kiwis from both hemispheres, picking them when they are perfectly ripe and guaranteeing their quality.